We almost stepped on this little guy when were out shopping. Poor thing was a long way from anything that was even remotely green and right in the middle of a walkway. I snapped a couple of shots with my fancy new phone - which is much better at taking a photo then I expected - while hubby did the rescuing. It was a bit of a walk but we got him over to the hedges without incident. Well done for rescuing the creature. It looks huge. He was 2-3 inches. I guess that's pretty big. So am I! I would have felt awful if we had stepped on him. I think they have some ridiculously long jumping ability that is almost flying but not quite. I guess if they could actually fly they would have a bit more control of where they would end up. Well done for rescuing him, I'm sure many people walked right by. I'm not sure I would have picked him up, to be honest. Hopefully I could have put him in something (maybe one of the many empty snack food tubs I seem to carry around). I always worry about hurting their little feet. I wasn't! I made DH do it. Aww it's always fascinating to find such creatures. I would just snap a picture from afar. If he had've jumped I'm sure everyone would have known about it as I squealed in surprise. Luckily he allowed us to move him without incident. I hope so. There was mostly just roads and carpark - not really a good spot for him at all. 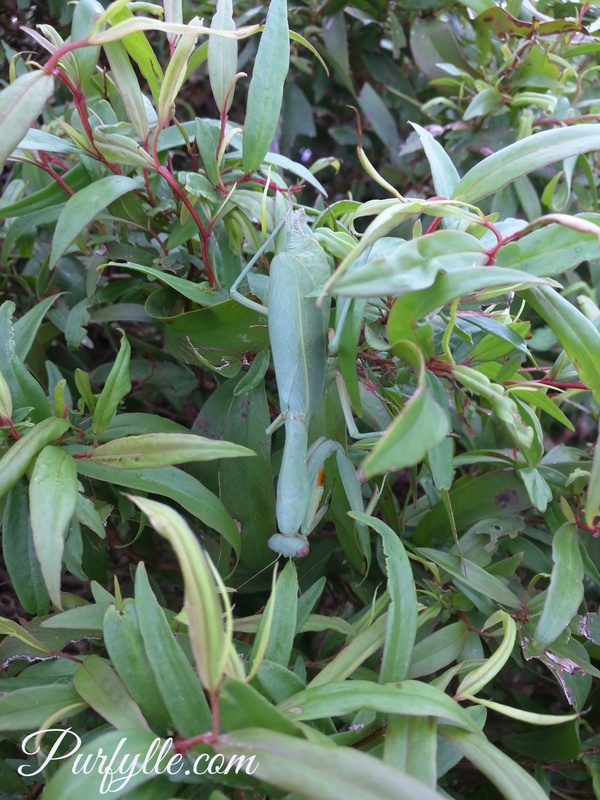 He disappeared into the foliage very fast, I almost couldn't find him again to take the shot. Well done on rescuing the wee critter. 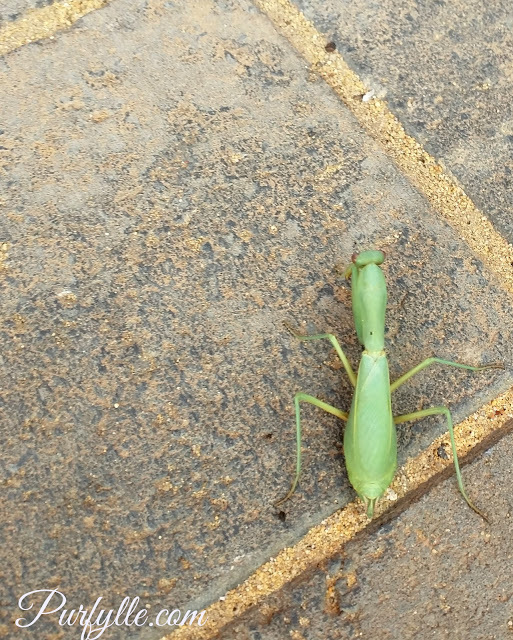 That's a lovely preying mantis. I bet he'll have better luck finding dinner on a bush! Meals, shade, safety from big shoes - what more could a Mantis want? And congrats on your new phone! I'm jelly! Planning to get one next month. My old phone was about 5 years old and was not doing so well. I hope you get a great deal on a new one. awww how sweet! thanks for the rescue! I am sure the little guy appreciates it! I think he may have been on the hot path for a while as he was a bit lethargic. I hope he cooled down and got back a bit of pep. Not too bad for phone photo right? I rescue such critters also, which has earned me a few strange looks... but that's fine. It makes me feel good in a strange way. Care to share his photo at http://image-in-ing.blogspot.com/2016/02/old-san-juan-pigeon-park.html? I've been really struggling to link up to mid-week linkies this year, I must try harder to visit yours which is one of my favourites! He's got the best camouflage skills. It must have been a really tasty morsel to entice him that far away from the foliage. His camouflage in the hedges is amazing. It took me a while to pick him out amongst the leaves. It's even harder in real life confronted with the whole bush, I nearly lost him completely which would have made for rather boring post about rescuing him. So cute! Great you didn't step over it. I'm glad I didn't step ON it! I'd have been the same - getting the other half to rescue him. I couldn't pick him up. I don't know what I would have done if it had just been me, maybe I would have tried to convince him to hitch a ride on my handbag.